How do I access Kenmore Washer Timer. 11023034100? Re: How do I access Kenmore Washer Timer. 11023034100? All you would need to do is flip the control panel up on that washer. 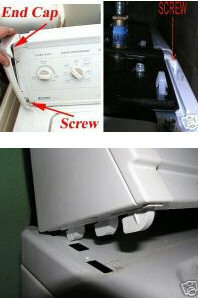 You do not have to pull the washer out and you do not have to take the back of the washer off. In the first part of this video you can see how easy it is to get to the back of the timer. The timer is held on with two screws that you will find under the knob. To remove the knob just push the knob in and unscrew it to the left. Once the knob is off the dial under it just lifts off. Once you have the knob and dial removed you will see the two screws that hold in it place. Very easy and quick job to replace the timer. No matter how hard I try, I can't flip the control panel. I have two screws in the back that I remove, but it won't bugde. Any ideas? BTW, I can't get to the video, i'll try it again. I would guess you did not remove the correct screws. Take a look at these photos and see if it helps. Once the screws are out you just slide it a little bit forward and then flip it back. The top left hand corner shows how some sears models are. The have a cover that must be removed before you see the screw you have to remove. Many others are like the one on the top right and are in the back corner. Some of the screws are right up front were they are easy to see and get to. In any case there is a screw someplace in each corner. Once remove the whole thing just flips up. Have had a couple people on dial up connections say they have had trouble with the videos, but that's dial up for you. Some of the videos are very large files. You do have the end caps like I showed in the photo then? If so sometimes there is a slot in the top back that you can put a flate blade screw drive in to help pop them off. Most often I can just grab it with my had and snap them off. SUCCESS!! Didn't even need the wife. Now see how easy that was.